'Shubhaarambh' is one of the few songs in Bollywood which combines the musical genius of Amit Trivedi with Swanand Kirkire's evocative words. Throw in some Gujarati, addictive dhol beats and an impassioned Divya Kumar and you have it — a therapeutic symphony perfect for garba. Falguni Pathak, The Garba Queen, will never go out of fashion, especially during the Navratri season. Although, she has disappeared off the mainstream music scene, the Indian pop icon holds concerts during the 9-day extravaganza and unsurprisingly, they get sold out in no time. 'Indhana Winva' is one such classic that you could dance endlessly to. Mahira Khan and Shah Rukh Khan's 'Udi Udi Jaye' from Raees is another song which could creep into your Navratri song collection. Catchy, contemporary yet very much traditional, this Sukhwinder Singh, Bhoomi Trivedi & Karsan Sagathia number can breathe life into your celebrations. 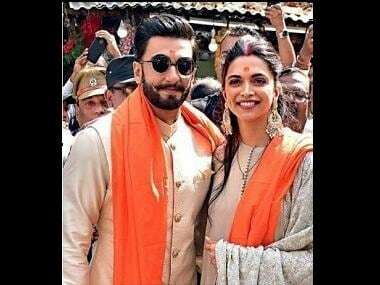 Picturised on Ranveer Singh and Deepika Padukone, 'Lahu Munh Lag Gaya' is a crackling combination of romance, garba and sensuality. Composed by Sanjay Leela Bhansali, the song fully utilises melodies which will take you back to Gujarat. You do not want to invite the wrath of the Dandiya Gods if you do not dance to this song during Navratri. Another masterpiece by Bhansali, the song only proves what is already known — no one, in Bollywood, makes dandiya songs quite like the filmmaker.